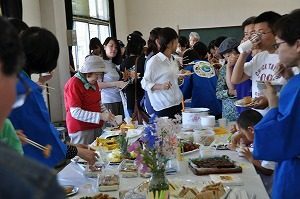 A cultural exchange party hosted by this association was held in the Fuchu learning community center. Luckily, we had beautiful weather and the turnout was good. The number of participants was 84 including 32 people from China, Vietnam, Taiwan, South Korea, the Philippines, Laos, and the United States. At the beginning of the party, the participants from other countries gave their self-introductions and we played several games to break the ice. After making a toast, we enjoyed many potluck dishes which were set on the tables. The dishes from these different countries were delicious. 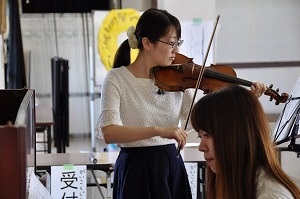 This year’s much-awaited entertainment was ensemble music (Piano ＆ Violin) and kendama,“a sword and ball”. We listened to the performance the two musicians gave. Members from the Hiroshima branch of the Japan Kendama Association demonstrated some techniques and some of us had a chance to try kendama, a traditional Japanese game. We had a lottery session as usual and people who won prices were extremely happy. We all had lively conversations and time flew as we were having a great time. The party ended with great success. It will be held again next May.